Enjoy this stylistic sampling—a snapshot into a period of dramatic, artistic flux. Each piece aims to align a core compositional concept with expressive clarity. Behind every performance is a balanced conflict between experimentation and tradition that propels the piece, challenges the performer, and, hopefully, engages the listener. 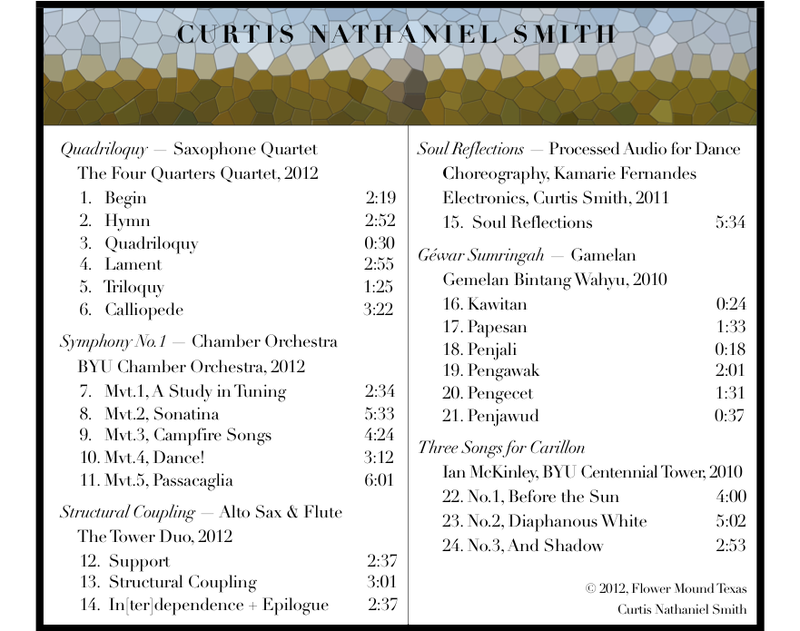 Curtis is a composer, teacher, artist, guitarist and recent MM graduate (Music Composition, BYU 2012). His music has been described as experimental, eccentric, fun, elegant, conceptually engaging, and lyrical. Special thanks go to Casey Grev and the Four Quarters Sax Quartet, Drs. Erin and Michael Torres of the Tower Duo, Kamarie Fernandes and the BYU DancEnsemble, Jeremy Grimshaw and Gamelan Bintang Wahyu, Ian McKinley, and the Barlow Endowment for Music Composition.